Season ticket holders will be contacted this week about their playoff tickets. We will print and give you all your playoff tickets at one time. You will get every potential playoff game (16 games =4 games per round x 4 rounds maximum} and then be charged after each round for the games that were played. The price will be the same discounted per game price you pay for your regular season tickets. A date for season tickets holders to pick up their playoff tickets has yet to be determined. 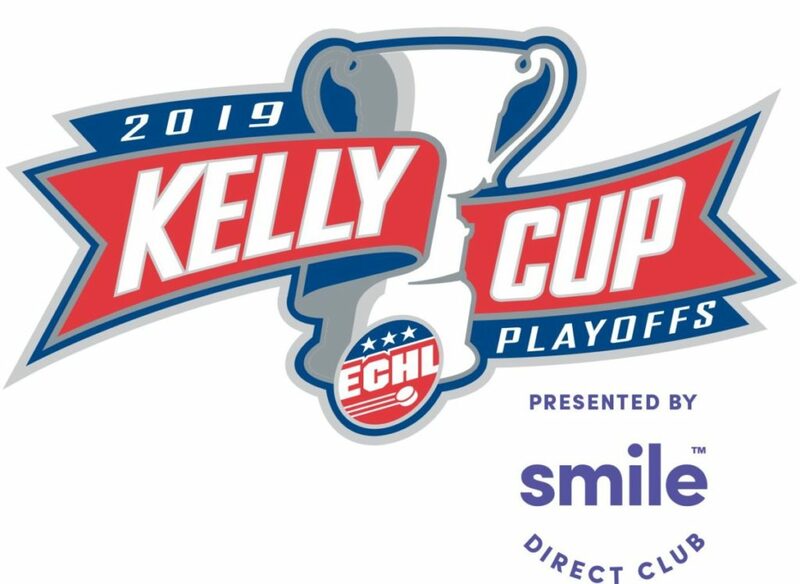 The first two rounds of the Kelly Cup Playoffs will be played entirely within the division, with the division winner playing the fourth-place finisher and the second-place team meeting the third-place team in the Division Semifinals. The winners of each series will meet in the Division Finals, leading to the Conference Finals and Kelly Cup Finals. Beginning with the 1996-97 season, the Patrick J. Kelly Cup is awarded annually to the playoff champion of the ECHL. History: Named in recognition of Patrick J. Kelly, one of the founding fathers of the ECHL. Kelly served as Commissioner of the ECHL for the first eight seasons before being named Commissioner Emeritus in 1996, a title which he continues to hold. Kelly is celebrating his 65th season in hockey in 2017-18, having begun his career with the St. Catherine Tee Pees of the Ontario Junior Hockey League in 1952. He played professionally for the Springfield Indians of the American Hockey League, the Troy Bruins of the International Hockey League, and the Greensboro Generals of the Eastern Hockey League. Kelly coached in the Eastern Hockey League from 1965-73 and was head coach and general manager of Charlotte in the Southern Hockey League from 1973-76. He coached the Colorado Rockies in the NHL in 1977-78 and is the only coach to lead the Rockies to the Stanley Cup Playoffs. Following coaching stops in the American Hockey League, he went to Peoria in the International Hockey League where he led the Rivermen to the Turner Cup in his first season in 1984-85. The ECHL is proud to recognize his distinguished career by naming its most coveted trophy in his honor.